"We loved you before we knew you. Even when there was just hope for you we loved you." Such beautiful words! And while this is true for every child, it seems to possess a special meaning for adopted children. 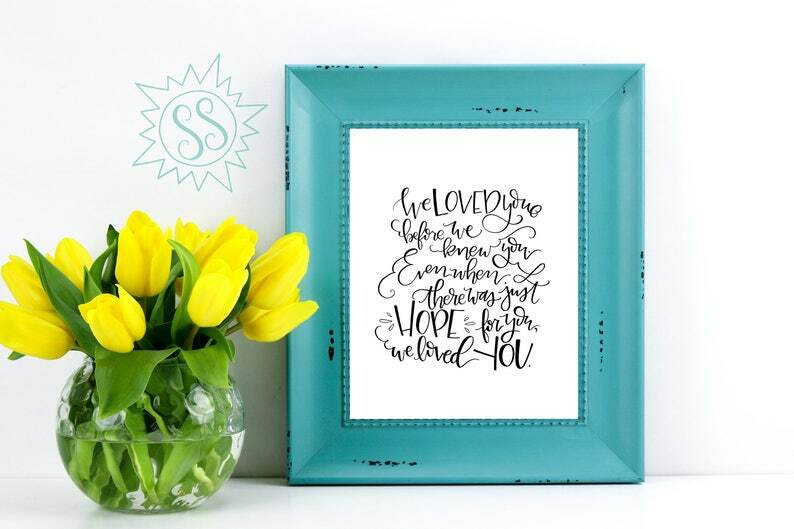 What a beautiful print to display in the room of a precious, adopted baby boy or girl. This is NOT sold as a framed piece. This will not be shipped to you. Your purchase includes an 11x14 PDF file for ease of printing . THIS FILE WILL NEED TO BE SENT TO A PRINTER (ie - OfficeMax or any local professional printer in your area). Because of the larger, 11x14 size it cannot be printed on your home printer. Please contact me directly at jessgard83 [!at] gmail.com or message me here on Etsy with any questions!